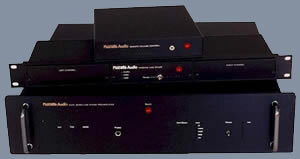 volume controls and preamplifiers available at any price. IN THE SEARCH BOX If you have been searching for the sonic purity and clarity that allows hours and hours of fatigue-free listening, Placette Audio has the pre-amps and volume controls that make it possible. Our exclusive use of the very costly Vishay S102 resistors in a proprietary 126 step attenuator eliminates the distortions present in even the finest quality volume controls. According to some audio pundits, the preamplifier is fast becoming a superfluous component. If true, then like turntables and 16/44k digital components, its flame is flaring brightest just before it dies. I believe these predictions are so much stuff and nonsense (few audiophiles I know are giving up their vinyl, their tuners, even their cassette decks). But whatever the fate of this component, it has had few brighter stars than Guy Hammel's Placette Audio preamplifier (review, Issue 125). With a generic (albeit effective) off-the-shelf Sony remote, the Placette hides its first-class parts (countless Vishay resistors), dual-mono circuitry, and volume control that is one of the finest ever developed (it may actually be the finest) under a prosaic black exterior (though construction is exemplary). Distortion is close to immeasurable, noise at the residual of the parts themselves, building and testing literally by hand, with specs and performance guaranteed for ten years. Transparency is Hammel's Holy Grail, and he has spared no expense or effort trying to achieve it. Sales are by direct mail, but an in-home trial with a 30-day money-back guarantee means you must be on your guard even more than usual: The Placette's see-through clarity is so seductive you're unlikely to be asking for your hard-earned wages back".